Perceiving changes in trends sharply and constantly, the ADEKA Group aims to create new products and technologies, taking into account their impacts on the environment and society. While required to provide socially demanded and valuable things, the Group believes that it should put priority on “gentle harmony between people and technology” as a company aiming to develop a better community. Furthermore, the Group considers it necessary to continue corporate efforts to create common values in partnership with stakeholders, striving to achieve “harmony with society” in terms of various environmental and social issues, in addition to social contribution through provision of products and technologies, as a respected member of the world community. The ADEKA Group has provided products and services that meet the needs of society, committing itself since its foundation to contributing to affluent lifestyles through its core business. The environment surrounding us changes as interest in sustainability grows around the world, under such initiatives as the United Nation’s Sustainable Development Goals (SDGs) and the Paris Agreement under COP21, and as the needs of stakeholders diversify. 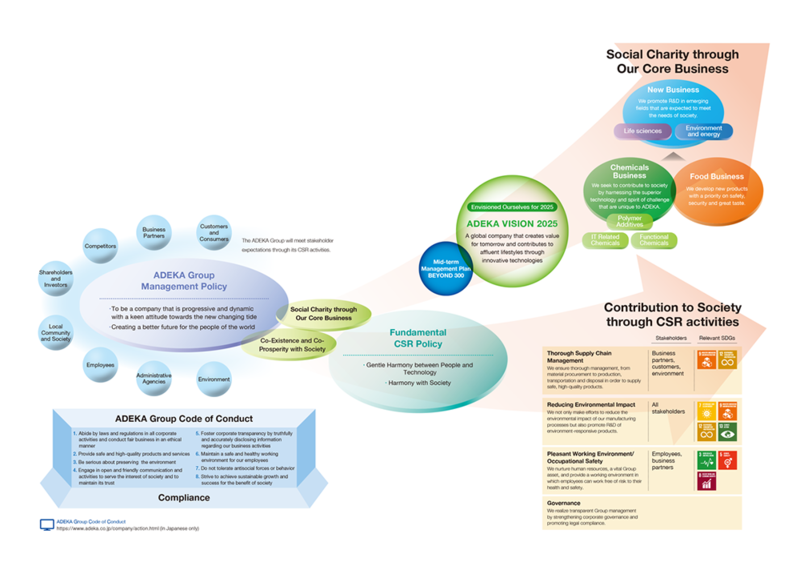 The ADEKA Group aims to achieve mutual prosperity with stakeholders by monitoring its impact across the supply chain. It will also fulfill its responsibilities as a manufacturer of materials by expanding its business areas globally with its technologies developed so far and its proactive approach. The ADEKA VISION 2025, our mid- to long-term vision formulated in 2015, calls for a global company that contributes to the prosperity of society by creating value for tomorrow through cutting-edge technologies. We will remain keen as seek to detect new, changing trends. Also, we will create value for society through our business, and with the efforts of each ADEKA Group employee, as we move toward creating a sustainable society.